Today is the big day and I'm ready to celebrate! 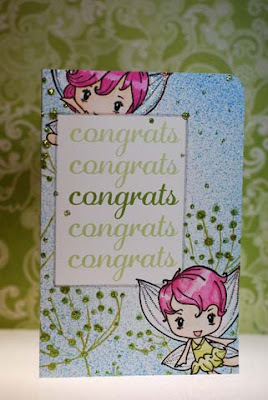 Now I may have only found The Greeting Farm a few months ago but as soon as I saw my first Anya stamp (Flutter to be exact) I was hooked. 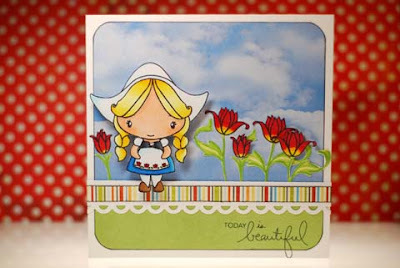 Marie's amazing designs are so much fun to play with and I find myself eagerly awaiting each new release. 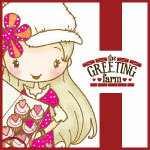 I also have to say that The Greeting Farm community has to be one of the friendliest I've ever come across. And the talent... wowzers! There is so much inspiration going up in that gallery every day, it's amazing! Is it sad that I love Fridays so much more now that I have these challenges to look forward to? What can I say... they get my mojo flowing! This week's challenge is another cool sketch from Jessica and I followed it pretty faithfully. 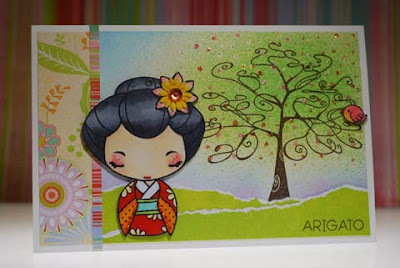 Little Annika decided that it was her turn to get inked up and on a card and I only did a few minor alterations like, erase her books before stamping, cutting off her head so I could place it at a tilt and adding a little hand up on the flower petal. Mmmmm... there is something about the color orange that just makes me happy! And to top it all off the new stamps are to-die-for cute. Seriously, the new Spooktacular Halloween set... just about gave me a cavity it was so sweet. LOL! I can't wait to get these new ones and start playing, there are so many ideas already floating around in my head and that's a great feeling to have. Here's another Miss Anya that I altered into a mermaid. I was much happier with how her colors turned out as opposed to the first mermaid I did. 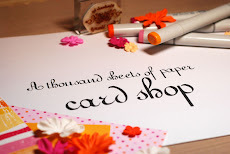 I'm having a hard time being patient, I even spent some time yesterday making my card for the big blog hop on Saturday and it is all ready to post... talk about being anxious! 1. Jenni Bowlin- Yeah! There are new chipboard buttons being released! These are so cool... I think my faves are the oldtime photo ones but all 6 new designs are great. Her new memo books don't look too shabby either. 2. Making Memories- I don't think I can really narrow it down to just a couple things... this is a company I've been buying from for years and years now. They are pretty much a staple in my stash and they never disappoint. But I am really diggin' the 50's retro vibe of their new Christmas line. 3. 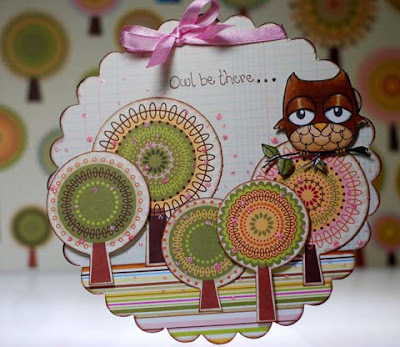 TPC Studio- I don't know much about this company and didn't like everything I saw but their Woodland Whimsy papers and most especially the stamps with the hedgehogs are a must have for me. I guess it's because I used to have a few african pygmy hedgies as pets back in the day so they will always hold a special place in my heart. Well sneak peeks from the floor of the show are finally rolling in and I'm making a list, checking it twice... gonna find out what new paper and supplies would be nice (to buy)... ok that was just bad LOL! 1. 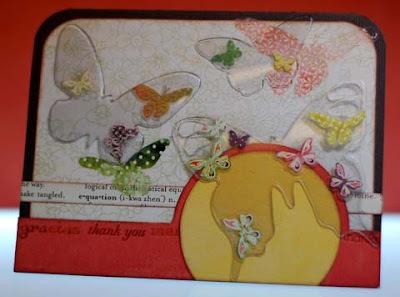 Tim Holtz Idea-ology- Two words... mask sheets. 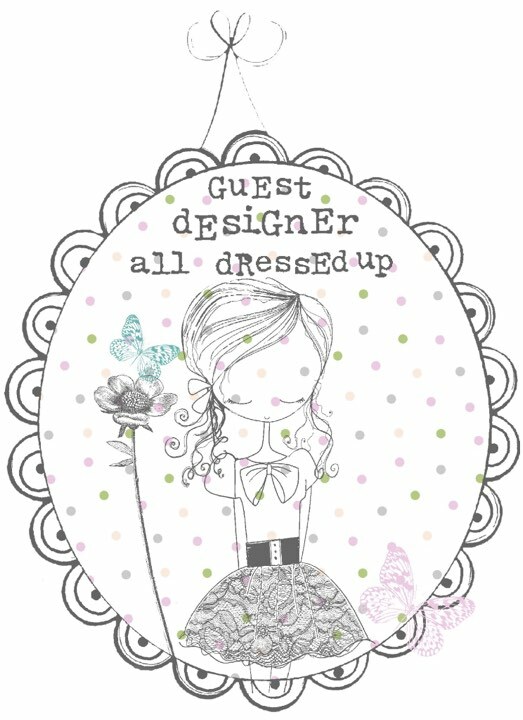 I LOVE playing around with masks, both Tim's and the Heidi Swapp brand, so the idea of being able to cut my own designs is too exciting for words! 2. 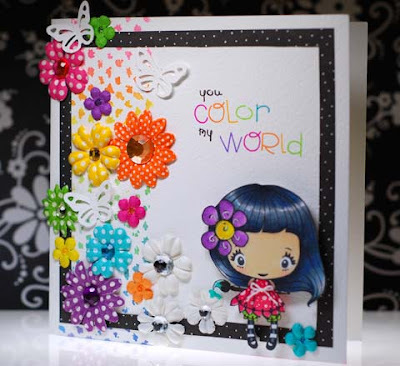 Maya Road- Their new mini chipboard shapes are to-die-for cute! I especially love the teeny tiny little cupcakes... so stinkin' adorable! 3. Basic Grey- I'm sure their new collections (Eerie, Eskimo Kisses, Indian Summer and Nook & Pantry) are on a lot of people's must-have lists and I am no exception. It is hard to choose a favorite out of the four because they are all pretty amazing, though I will say that I am extremely excited to see them finally releasing a Halloween line... yeah! Thanks Traci! You made my day! 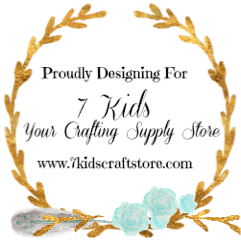 Now it is my turn to pass this badge onto five blogs that inspire me. 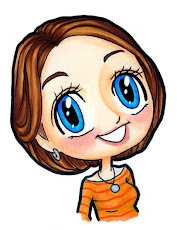 I am embarrassed to admit that being so new to all of this blogging stuff I'm only going to have three since some of who I would list have already been given the badge... Traci being one of them. 1. 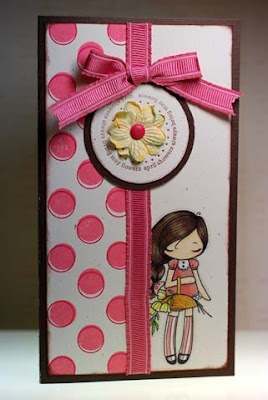 My Little Shoebox- This is a newer company and I love their bright colors and whimsical designs. 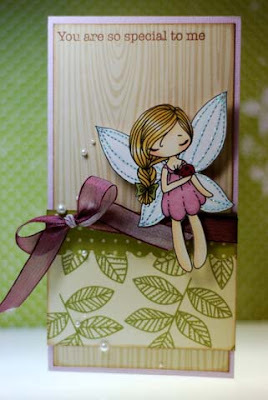 I'm especially excited for their Little Ladies and In the Forest lines... super cute! 2. Pink Paislee- Now I'll admit, this company has never been on the top of my list before but I'm really impressed with what they have done for this release. My favorite is their Halloween line, Twilight. Though Mistletoe&Co is pretty cool too. 3. Shabby Green Door- Another new company though they are a division of Daisy Bucket... what caught my eye from them are the four spools of colored twine that go with their Farmer's Market collection. I'm all about adding twine to my cards these days so these will be a definite must have for me! Now onto my card for the day. 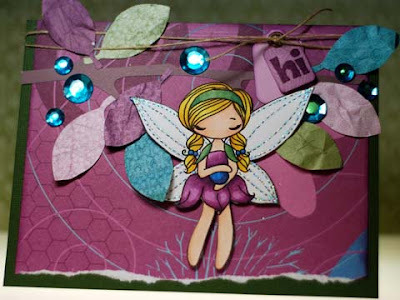 This is another altered fairy I did a week or so ago using another Miss Anya. I think this is one of my favorites so far, probably because of the color combo... I'm a sucker for anything with orange in it. Another quick post as I am heading to town soon... it's going to be a busy day. I made this card as I was still playing around with some ideas I had for altering Anya's. I was also experimenting with Copic combinations for the hair and skin on this one and I can't say I was thrilled with the results. Oh well, how else do you learn... right? 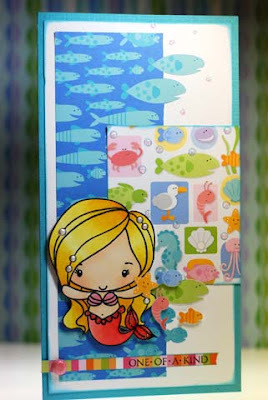 And since she wasn't so bad that she had to be tossed I gave my little mermaid a home on this card. The quote is one I found on the internet and I thought it was cute. 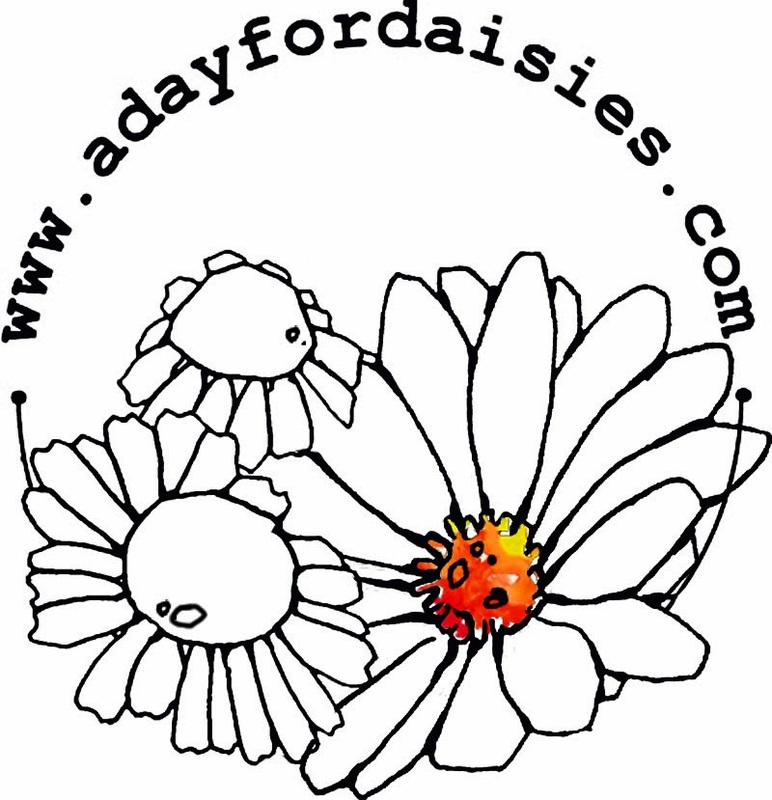 I also wanted to take a sec and send out a big "Thank you" to all you ladies who have left such kind comments on this little fledgling blog of mine. It encourages me to know that maybe this wasn't such a crazy idea after all! No one would ever accuse me of being a fashionista, so when Jess issued a summer couture challenge over at Club Anya I had to hit google and do a little research on the 'hot trends' for the summer. I found just as much inspiration as I did outlandish looks... which makes me wonder, does anyone really wear some of those get-ups? I certainly don't see them around here but I'm livin' the life in small town USA. Not exactly a fashion mecca. Anywho... for my little summer girl I went with the trends of: mini dress, big bold belts and bangles, as well as a sassy side ponytail. I used a combination of the Miss Anya with the flower basket (head) and Rain from the rain, snow, shine Miss Anya set (body and skirt), both heavily altered using my light box method to create this 'heart breaker'. 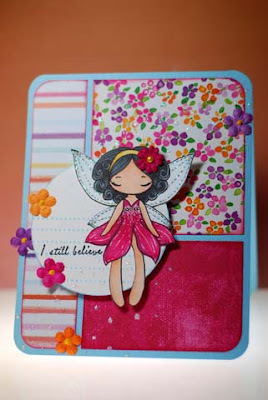 Ok, so I got my card done for the FFF Fluttery Floral challenge... yeah! I used Wild Sprout Dahlia just slightly altered, I changed her mouth, got rid of the buttons on the front of her dress and swapped out the flowers she was holding behind her back for a paint brush. OMGosh! Have you seen what's new at The Greeting Farm blogs?!? 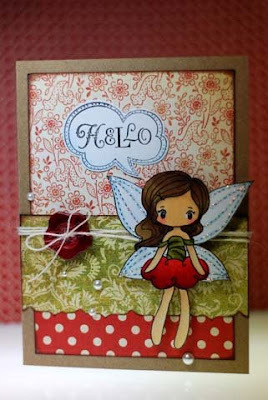 If not, run... don't walk... over to www.clubanya.blogspot.com and www.splendidstamping.blogspot.com I promise you will not be disappointed! There is a NEW Miss Anya set being peeked and two challenges issued with it as the prize. Seriously... it's time for me to put my thinking cap on and get to work. Despite my lack of enthusiasm for these dog days of summer I do love me a great summer color combo or two... 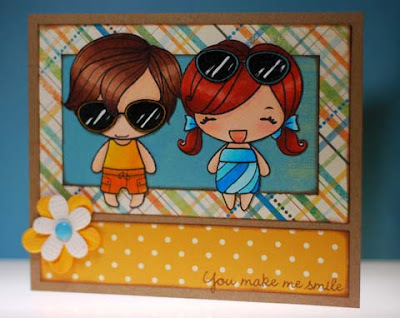 I made this card for the last Club Anya VSN sketch challenge and it features my fave summer colors, yellow-orange and aqua. I used the Dress Up set but I did alter Anya a bit by replacing her head with Cheer Anya's head... the hair just looked a bit more summer funnish to me. I also used UTEE on the glasses to give them a glossy sheen that you can't really see in the pic. At least not today but this evening will be busy. 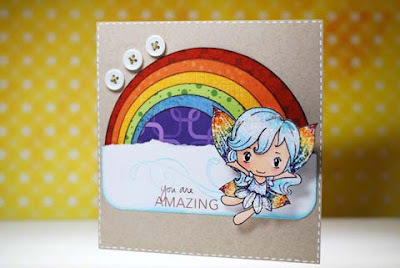 I have my card class tonight and it's sold out so that will keep me on my toes and be a lot of fun. It's also So You Think You Can Dance night ! I'll have to tape it so I don't miss the first hour 'cause I love that show... a total guilty pleasure. ;) Anybody else watching? Personally, I don't think the boys this year are as strong as the ones last year. Maybe that's why there haven't been as many "WOW" routines... who knows... but it's still a fun watch. Now onto my card for the day. 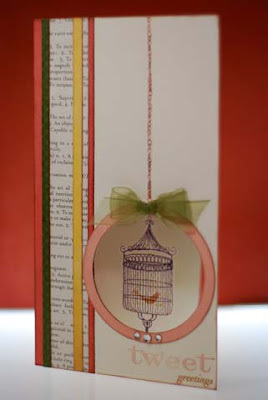 This is a simple one I put together for the FFF Supplies, Supplies challenge a couple weeks ago. We were supposed to use at least two different stamps, punches and bling. 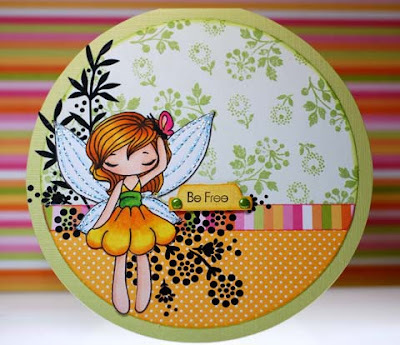 The BIG news this release is the addition of some new embellishments to the product lines and can I just say there will be stamps... oh yes there will be stamps... yeah! 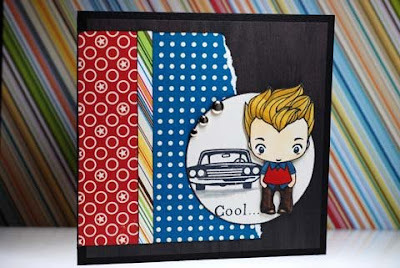 I'm just keeping my fingers crossed that the cute little robot image from Super Stud will find his way onto a stamp... want to check it out for yourself? Go to www.bellablvd.typepad.com you won't be disappointed. 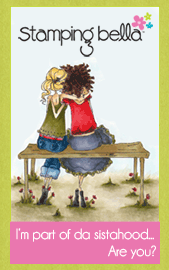 My card today actually features Bella Blvd papers from the Family Tree line... love 'em! 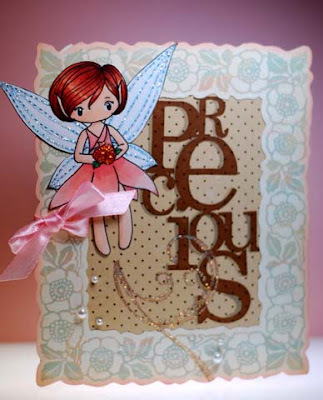 This is another altered Miss Anya fairy and the card is following my summer goal to use up as much of my paper scraps as possible. In fact, I took it a step further on this one, see the wood grain pattern in the background? That is actually the packaging from a Making Memories stamp set I had gotten recently. I thought it was too pretty to throw away and I was very proud of myself for putting it to use so quickly... yeah me! Oops... this one wasn't showing up in that last post. Remember, total blog noob here so I'm still trying to get it all figured out. I'm off to work now, hope everyone is having a great weekend! 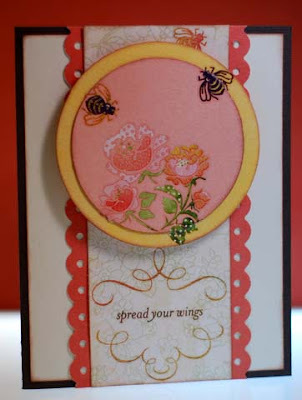 Warning: This post is fairly photo heavy but I wanted to share some cards I created for this month's card class at the LSS I work and teach at. I built this class around the whole idea of using rub-ons. I've found that even though they have come a long way in quality over the past few years there are still a lot of people out there who think they are too difficult so they never try them. I also wanted to give them some ideas on the different types of surfaces you can apply them to... that they go on so much more than just paper. 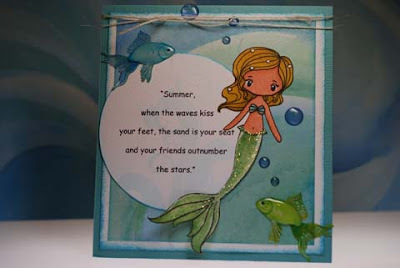 I haven't been keeping it a secret that I would love for Marie to make some Miss Anya fairies and mermaid stamps... I think I suggest it every VSN night at the Club Anya PCP page. Until that day comes though I will have to be content with altering my own. I had some scraps of the fishy Doodlebug papers still sitting on my desk from a previous project so my inspiration totally came from that. 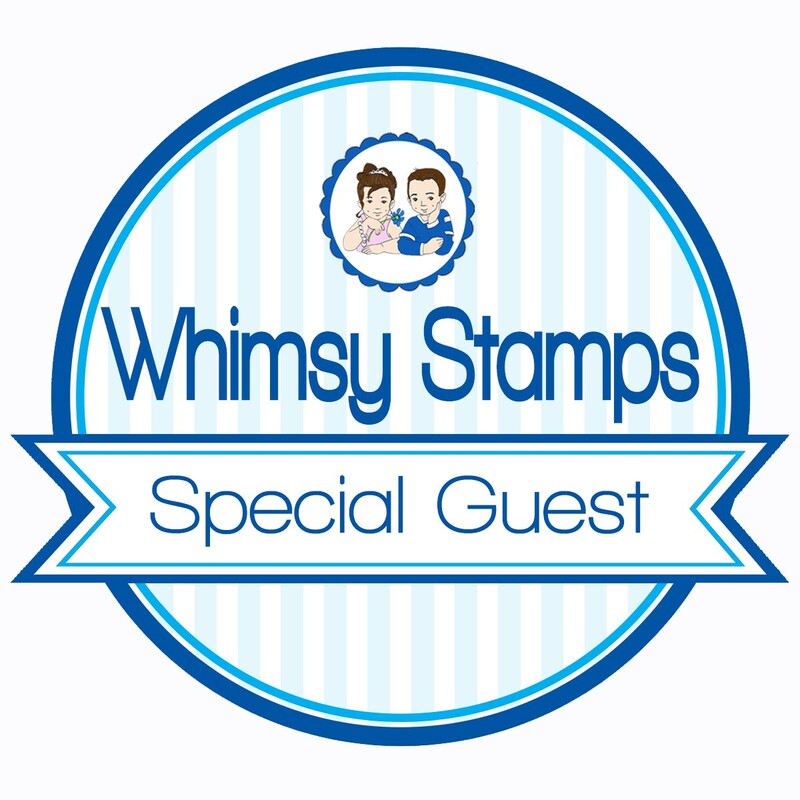 Especially once I realized how perfect a match in style the Greeting Farm stamps are to Doodlebug's designs, both are very playful and kinda cartoon-y looking. 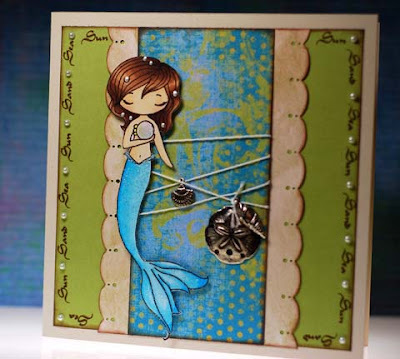 I only did some slight altering to the mermaid stamp by swiping the ink off of her closed eyes before I stamped and then drawing in some open eyes for her to see all her little friends with. 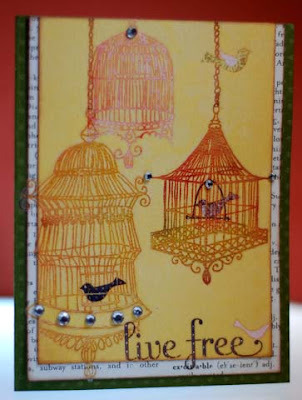 Here's a card I made for the Farm Fresh sketch challenge at the Greeting Farm. You could have knocked me over with a feather when it was actually chosen as that weeks winning entry! 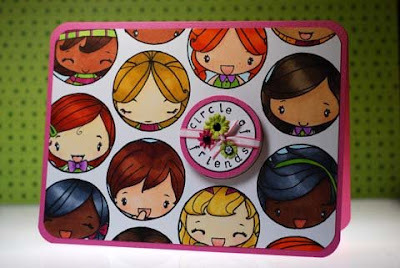 I used a lot of different scrap paper, cut out with my Coluzzle (SO bummed to hear that Provo Craft isn't making these anymore, they were always my #1 recommendation when someone needed a small circle cutter. )to make the rainbow. So far I'm not doing too bad with this goal, though I still have a long ways to go. I'm thinkin' I like the photos on the left like this, so I guess I'll stick with this set up until I learn more. Are you tired of seeing Greeting Farm challenge cards? Not me! 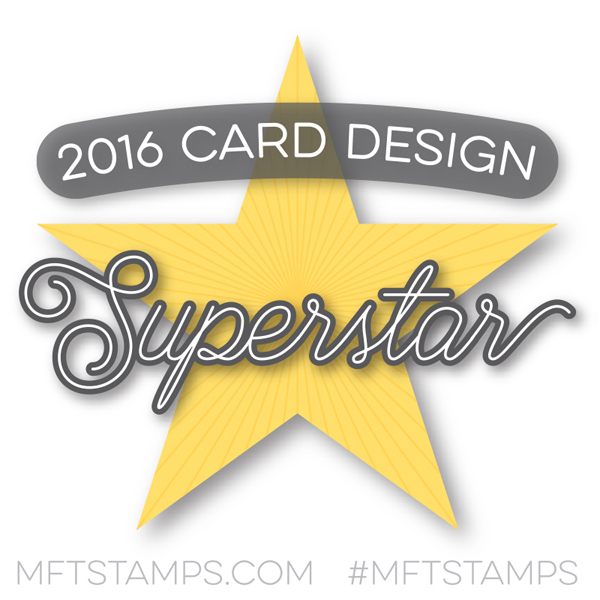 What can I say, these have quickly become some of my most favorite stamps to play with. 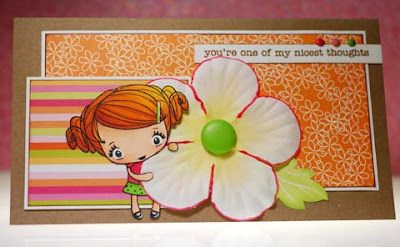 This is one of three cards I made for the Dotty Spotty challenge. Here we have yet another past Greeting Farm challenge. 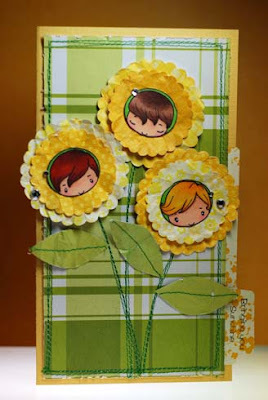 This one required you to use three different Greeting Farm stamps on one card. This was also my very first attempt at coloring with Copic markers, I have since become completely hooked on them! Though I still have a lot to learn with blending and what not. Ok, I'm going to figure this photo posting thing out eventually, grrrrrrrrrrr... I am SO not computer literate. so I thought I would practice posting some pics. 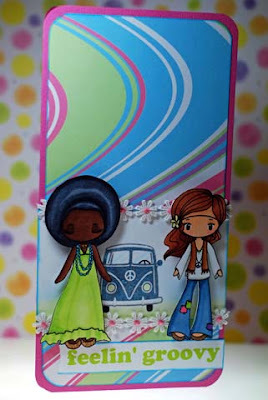 This is a card I made for the Black and White challenge at the Greeting Farm back in May I think... it was only my second time playing along but I really had a lot of fun with this one. Honestly, I thought I would be the last person on the face of the earth to have a blog. But, here I am. 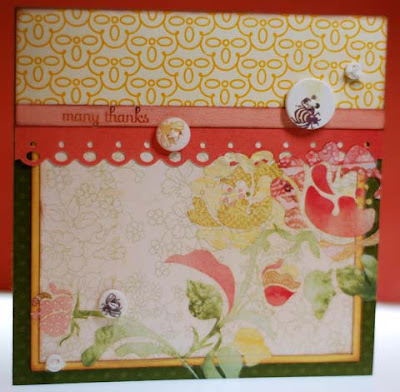 I blame it on The Greeting Farm... those stamps are just too darn cute and I'm enjoying the community over there so when the big Anyaversary blog hop was announced I didn't want to miss out. I guess it will be a good place to post pics of my cards and what not.